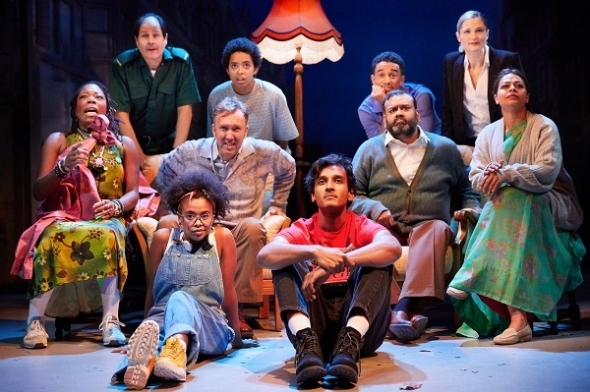 CLEVER, witty and inventive – the stage adaptation of Zadie Smith’s seminal novel, ‘White Teeth’ – possesses all the attributes of its famous progenitor. Indeed, at the very heart of it, is a story about two families and how they negotiate the period from the post Second World War to around 2010. Smith’s brilliance, as a chronicler of those who left one place to come to another (immigrants) and the people behind the statistics, is amply and very ably served in this suitably fine production, which is in some ways a ditty and upbeat musical drama. In another way, it is also a modern, multicultural panto – and that is not to do it a disservice at all – it is more accessible and entertaining play, for all that. Stephen Sharkey’s stage adaptation of the novel covers a lot of ground in the two hours and forty minutes and if everything Smith wanted to say could be compressed into that, she would no doubt have written a play and not a novel. Well-established playwright Sharkey’s version uses the music of the time to convey a sense of atmosphere and reflect the changes that are going on in British society at the time. It’s very well done and sometimes there are even flashbacks within flashbacks, and while the odd one might seem a little forced or unnecessary, they have a function as dreamscape for our heartfelt and sincere narrator. Sometimes, it’s a little hard to tell – reality or dream – but that does not really detract or undermine the central motor driving almost everything forward – who is Rosie Jones (Amanda Wilkin) and how did she come to be…? There is a love story behind it and it isn’t Mills and Boon, as you know it. The youngest character over the whole duration of the play – Jones, we learn is pregnant early on and that sets her off on a path to find out just how she came to be, both literally and metaphorically. Who is her father? What is especially good about this – is that you quickly get the two families and what they are about – in fact there is a lot more to the Iqbals than there is to the Jones’. But that’s not a point, it’s what happens in between that really gives this production its hum and musical fizz. There is dad, Samad Iqbal (Tony Jayawardena), his wife Alsana (Ayesha Dharkar) and two sons, Millat (Assad Zaman) and Magid (Sid Sagar). Millat is your almost typical Asian rudeboy of the 1990s; Magid is studious and finds himself packed off to Bangladesh to get a superior science education. They all riff nicely off each other, while other characters move through their past. There are choices and consequences… it’s fun, entertaining and thoughtful and where Smith’s language and stylish prose and absorbing characters keep your attention in the novel, the stage version has a live band and upbeat tunes and that pressing search for identity. All in all, it’s great to see a familiar world on the stage, writ large. ‘White Teeth’ (adapted from Zadie Smith’s novel of the same name by Stephen Sharkey), until December 22, (7.30pm/2.30pm), 269 Kilburn High Road, London, UK, NW6 7JR.